I rolled into Austin airport this morning around 2 AM, completing the second leg of my journey from Dulles International in Virginia through Dallas Fort Worth. The flight from DFW took off on time (10:35 PM), but halfway through the 30 minute flight the engine which was conveniently placed right next to my seat decided that now was the perfect time for one of the blades in the turbine to come loose and make the airplane shake like I’ve never seen before. Instead of continuing on to Austin the pilot declared an emergency and landed back at DFW. The picture above is one of the very concerned firefighters who greeted our aircraft with a sea of fire engines and foam trucks when we landed. We then proceeded to spend a couple hours moving from gate to gate as they tried to find an aircraft to get us to our final destinations, eventually landing in Austin around 2 AM. By the time we get to Tyler’s family’s house it’s 4 AM, and we grab about 2 hours of sleep. Being up all night and operating with little sleep is nothing new (thanks to my shifts with the fire department) but I was a little concerned about using deadly force with such little rest. 6:30 AM rolled around and we got up, got dressed and headed out the door for the blind that Tyler had set up earlier in the week, which overlooked a pile of corn being used for bait. We had just sat down in the blind (I was using my Weatherby Vanguard Carbine that I’ve been prepping for the 1,000 yard rifle for under $500 project) and settled in when a doe and a yearling waltz towards our blind out of a draw to our 9 o’ clock. Like, directly AT our blind. The deer eventually walked within 10 yards of our position, stared straight at us, and then continued like nothing was wrong off into the woods to our 3 o’ clock. They were literally too close for a good sight picture with the Weatherby (I having left my .300 BLK AR-15 in the truck), and by the time they were at the right distance they ran away into the woods. While we were waiting for the deer to loop back around and start munching on the corn I heard some footsteps coming from our 9 o’ clock again. I turned and saw a pack of nine wild hogs emerge from the woods casually walking right past where the deer had just strolled. I pointed it out to Tyler who immediately insisted I take a shot at the largest one, who had conveniently stopped for a second about 50-75 yards out. I took aim at its head, squeezed the trigger, and watched as the pig dropped straight onto its side. It was the first kill I had ever made, with a gun whose zero I hadn’t checked since it came off the airplane. At this point the pack started picking up speed, but it wasn’t outright running just yet. More like a slow trot. Tyler encouraged me to take a shot at another pig as they came out of a wooded patch so I picked a hog, did some mental math to calculate the proper lead, waited for it to line up right in my crosshairs and pulled the trigger. I couldn’t see what happened because the gun moved too much so I didn’t know if I had hit anything yet. I honestly thought I had missed the second hog completely. We walked over to the first hog and it was 100% dead. There was no question about it, I had hit the hog squarely in the head and it had dropped straight down. It was twitching a little bit, but that soon stopped as well. We loaded it up and went to check on shot #2, and lo and behold there was another dead hog with a rather large hole where part of its skull was supposed to be. Two quick trigger pulls had resulted in two headshots and two instant kills for some delicious bacon-to-be. As I sit here writing about the experience three things strike me about this morning. First is how important it is to hear what is going on around you. I was able to hear the hogs before they could be seen, and the reason I heard them before Tyler was that I didn’t have my ear protection on at the moment. Communication between hunting partners as well as audio situational awareness seem to be key parts of hunting, and that can’t happen effectively with traditional hearing protection. It makes me appreciate the silencer that should be coming next month all the more, and I would prefer to never hunt without one ever again. Second was how fast my training kicked in and took over. I felt myself run through “sight picture, breathing, trigger control, follow through” as I lined up on the animal and took the shot, but I didn’t have to articulate every step of the process to myself. It was a fluid process that took a fraction of a second but was the result of years of training and hours spent on the range each week. It was like hitting a target during a shooting competition, but at least for the first animal I could choose when I fired and could take my time. Third was that the saying “shot placement reigns supreme” really does hold true. 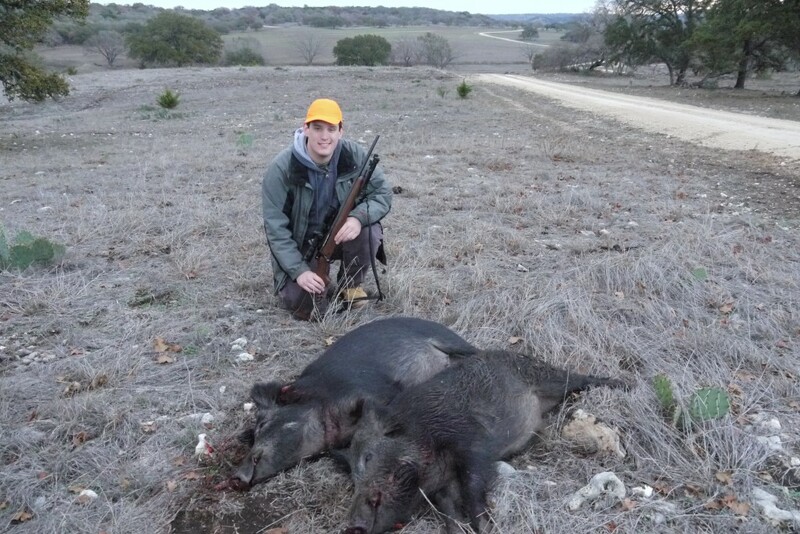 I was using 168gr HPBT match bullets in a .308 Winchester cartridge that I loaded myself, and even though I wasn’t using the latest “hunting” ammunition or specialized hollow point rounds I still dropped two hogs cold in their tracks with two well placed shots. I suppose specialized hunting ammunition might help and increase the damage, but in the end placement is king. The above hog picture, by the way, shows the exit wound of my .308 round. Good job Nick! I’m very happy to hear that you are one of the few that can experience the ‘flow’ of hunting, an get rid of some pests at the same time. All this talk about hogs and bacon is making me hungry. Nice shooting Nick, now go get a deer! Those look like some good eating size pigs. You also put the rounds in my preferred spot, right behind the ear to shatter the spine. I must warn you, once you’ve tasted wild pork you’ll not be satisfied with domestic pork again. Congratulations! Welcome to Texas and thank you for two less hogs! Now, get the heck away from the computer and back out there and bag yourself a nice deer or two. Boo-yah! Durn good shootin’ there, Pardner. Notice how I instantly slipped into that down-home Texas patois? Yeah, it’s a skill. My first Texas hunt was many years ago. I was invited to hunt pesky feral hogs on a private ranch near Honey Island, in Hardin County. I purchased my hunting license, and asked our host about recommended weapons and loads. He told me that he was a “smoke poler” and used a .50 TC Hawken loaded with maxi-balls. He also carried a Ruger Old Army with conicals. Following his example, I took my .50 TC and my stainless Old Army. I caught a 300 pound hog with the big .50 maxi, which I cast from pure lead. It shattered his left shoulder, clipped his lungs and heart, and was under the hide on his right side, flattened and deformed. He dropped instantly. He hit another 300 pounder, not fatally, which decided to charge him, bearing its sharp tuskers. He dropped the Hawken and fired his .44 conicals in panicked self-defense as the hog charged, dropping pork just yards away. A local meat market processed the hogs resulting in a few hundred pounds of assorted cuts and sausage. I gave my host all of my pork, because my Jewish wife would not let it in the house. We did attend a cookout at his house. I appreciate the “graphic” pics, I really do. The topic of where food comes from is something that needs to be faced squarely. The act of killing something is not to be taken lightly. Eating meat from a local wild animal that was killed quickly by trauma to the brain has a certain purity, imo. +2 on that, modern reality is far too divorced from the actual reality of how we subsist. Good job. Two shots, two clean kills. The pigs didn’t suffer (I don’t like feral hogs, but I don’t like to see an animal suffer, either). Good luck with the venison. I went hunting for the first time this last weekend as well. I was quite surprised at how well I did, considering it was the first time I shot at something that was breathing. Two shots, with iron sights, at a running deer, at approximately 75 yards resulted in two hits approximately 3 inches apart and my first kill. Those thousands of dollars spent on target practice over the years seem to have built up a good automatic reaction. I was worried about shooting without hearing protection. After this first experience, I am convinced that you need to go without hearing protection to be able to do it right.